Greene Fire’s state of the art MicroLouvre Fire Attenuation Screen has now been tested and proven to have market leading performance. The specially angled, bronze Louvres create the perfect solution for reflecting heat. when tested at CSIRO the MicroLouvre Fire Attenuation Screen achieved an industry leading 49.4% attenuation. This ensures floating embers, naked flames and radiant heat do not pose an ignition risk to your property. Given the increasingly high densities city-dwellers are living and working in, protecting buildings from fire is more important than ever. Not only does MicroLouvre provide the highest amount of fire attenuation, it also has twice the open area of other screens. This makes MicroLouvre almost invisible from the inside, giving perfect outward vision. Used as a fire engineered solution to protect openings close to property boundaries, make sure you consider MicroLouvre Fire Attenuation Screen to get the most benefits for your building. Read our white paper on how our MicroLouvre Fire Attenuation Screen’s can make any environment a safe and comfortable environment. 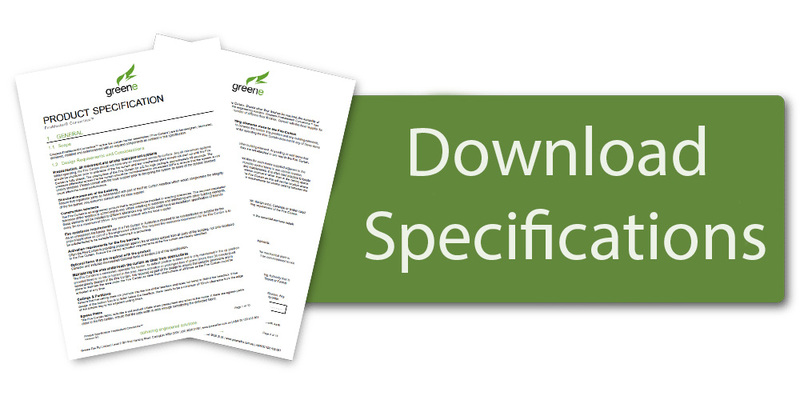 Alternatively, you can download our product PDF and Drawings for more detailed information. The MicroLouvre technology pioneered by Greene Fire is an ideal addition to buildings within any setting. As the Louvres are spaced less than 2mm apart, the MicroLouvre Fire Attenuation Screen is compliant to AS3959 for use as a bushfire prevention screen. As seen in the Image below, the MicroLouvre Fire Attenuation Screen is more than capable of withstanding high levels of heat. Fire attenuation screens are often compared by the percentage in which the screen reduces heat. This means that our industry leading 49.4% attenuation would reduce the heat at the location of the screen by 49.4%. This sounds simple enough, however, testing and proving this is not so straightforward. As no standard test methodology exists, some claim the percentage attenuation as the reduction of heat at the screen, measured 365mm behind the screen. In reality, the heat has already reduced even without the screen in place at that position! Where would a MicroLouvre fire attenuation screen be used? The population density within our cities is growing at a rapid rate. This means that we are constructing our buildings closer to the property boundary and each other. Class 2 to Class 9 buildings built within 6 meters of the property boundary require fire protection for external walls. Practicality and cost-effectiveness make Greene Fire’s MicroLouvre Fire Attenuation Screens the ideal solution. C3.4 of the National Constructive Code (NCC) states that external wall openings are required to be fire protected. The options include using 60-minute fire rated doors, fire windows, fire shutters or external wall wetting sprinklers. MicroLouvre fire attenuation screens offers a cost-effective alternative to the NCC Deemed-to-Satisfy (DTS) requirements. A fire engineer can use the extensive testing and high performance of MicroLouvre fire attenuation screens to determine a design where the building can withstand a minimum heat flux in accordance with Verification Methods CV1 and CV2 as defined in the NCC. Installing MicroLouvre fire attenuation screens to your Class 1 building (domestic dwellings) meets the requirements for screening in bushfire areas as required in AS3959-2009 up to BAL-40 & BAL-FZ. To obtain peace of mind and ensure your building meets the highest fire safety standards. Rely on Greene Fire for our MicroLouvre fire attenuation screens. For Further Reference please read the documents provided below. If you wish to obtain further information regarding our Fire Attenuation Screens, please contact us at (02) 9526 3100, or email us at sales@greenefire.com.au.